We provide audio description, signing and captions for all performances for this production. A relaxed performance is also available. Watch our BSL flyer or listen to our audio flyer on our Access page. Live audio description is delivered by a cast member on stage at every ​performance of Our Country’s Good. To access the audio description, headsets are available at the Box Office. 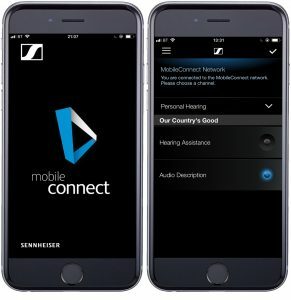 If you have a smart phone you can download the Sennheiser MobileConnect App. Download the App, then once you’re at the venue, choose the MobileConnect network on your Wi-Fi settings (no password is required). Once you open the App, there is a choice of Hearing Assistance or Audio Description under Our Country’s Good, click Audio Description. You can bring your own headphones or use ours. Pre-show notes will be played through the headsets or App 15 minutes before the start of the show, in the auditorium. Arrive early to access these notes and other resources on our access table. A Signed Synopsis of Our Country’s Good, produced by Nottingham Playhouse Theatre Company in co-production with Ramps on the Moon. The programme for Our Country’s Good is available in accessible formats including Large Print, Braille, Audio and Easy Read. Are available – please contact the box office in advance to arrange your tour.